Le Strange Arms Hotel01485 534411work01485 534724fax HotelThe hotel grounds run down to one of the best sandiest beaches in an area of many lovely beaches. In the vicinity are Royal Sandringham, Holkham Hall, Norfolk Lavender, the Norfolk Coastal Footpath, various wildlife reserves, including RSPB Titchwell and numerous other places of interest. The hotel's position makes it especially suited to family holidays, whilst guests preferring a quieter time can enjoy the peace and beauty of the surrounding countryside and Heritage Coast. 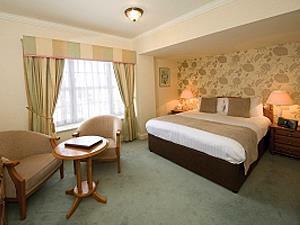 The hotel offers a wide range of room styles, from four posters and suites to family rooms, many with sea views. The Boat House has two excellent self-catering apartments. The Restaurant offers Table d'Hote and A la Carte menus with friendly efficient service. Lounge Bar and Snooker Room available. The hotel's adjoining pub, The Ancient Mariner Inn, has a wide range of traditional beers and offers snacks and light meals served in the bar, on the lawns and in restaurant. Le Strange Arms Hotel limits bookings to 2 or more days. The hotel grounds run down to one of the best sandiest beaches in an area of many lovely beaches. There are two children's rooms and a small play area. We guarantee you a warm Norfolk welcome. Watersports nearby Children welcome from any age. One mile outside Hunstanton, just off the A149. A149 to Hunstanton, then continue until the road makes a sharp turn to the right. Go straight ahead into Golf Course Road hotel 50 yards down the road.